The Airport Authority Hong Kong (“AAHK”) is responsible for operations of the Hong Kong International Airport (HKIA). 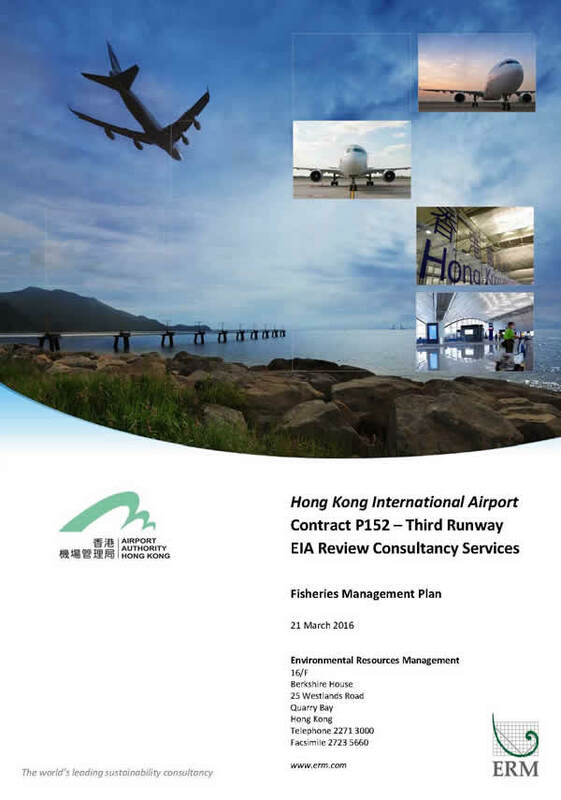 Its HKIA Master Plan 2030 (MP2030) recommended expansion of HKIA into a three-runway system (3RS) (“the Project”) as the best way forward to cope with the projected increase in air traffic demand and to secure the continual growth of HKIA operation for the benefit of the economic development of Hong Kong. 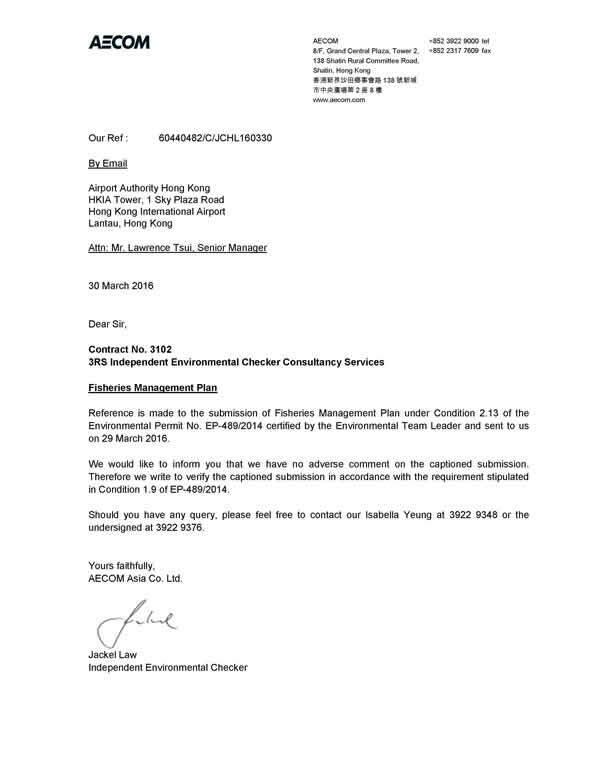 For planning purposes, this development option for HKIA received approval in principle from the Government of the Hong Kong Special Administrative Region (HKSAR) on 20 March 2012. An Environmental Impact Assessment (EIA) Study Report for the Project was prepared in accordance with the study brief requirements (ESB-250/2012) issued by the Environmental Protection Department (EPD). The EIA Report for the Project (Register No. AEIAR-185/2014) was approved by EPD on 7 November 2014 and the Environmental Permit (EP) (EP No. EP-489/2014) granted on 7 November 2014. As part of the EIA Study, AAHK has proposed to formulate and implement a Marine Ecology and Fisheries Enhancement Strategy (MEFES). The MEFES for the Project has been set up for the purpose of enhancing the marine environment for the benefit of marine ecology (including Chinese White Dolphins (CWDs)) and fisheries resources in the vicinity of the project area, in Hong Kong western waters and further afield into the Pearl River Estuary (PRE). It is also for the purpose of providing support and assistance to affected fishers to achieve more sustainable fishing operations. Figure 1.1 presents a schematic overview of the different elements of the MEFES and their proposed funding sources. Details of the MEFES are provided in Annex A. In accordance with EP Conditions 2.8 and 2.13, AAHK will establish independent Marine Ecology Enhancement Fund (MEEF) and Fisheries Enhancement Fund (FEF), respectively, to fund initiatives proposed by third‐parties (eg Non‐Governmental organisations (NGOs), researchers and the fishery sector) that support the objectives of the MEFES. A Marine Ecology Conservation Plan (MECP) and a Fisheries Management Plan (FMP) are developed to describe the proposed mechanism for the implementation of the MEEF and FEF as well as the goals and themes under which funding applications can be made. This document presents the FMP of the 3RS Project. · Support the promotion and enhancement of fisheries-related business opportunities. 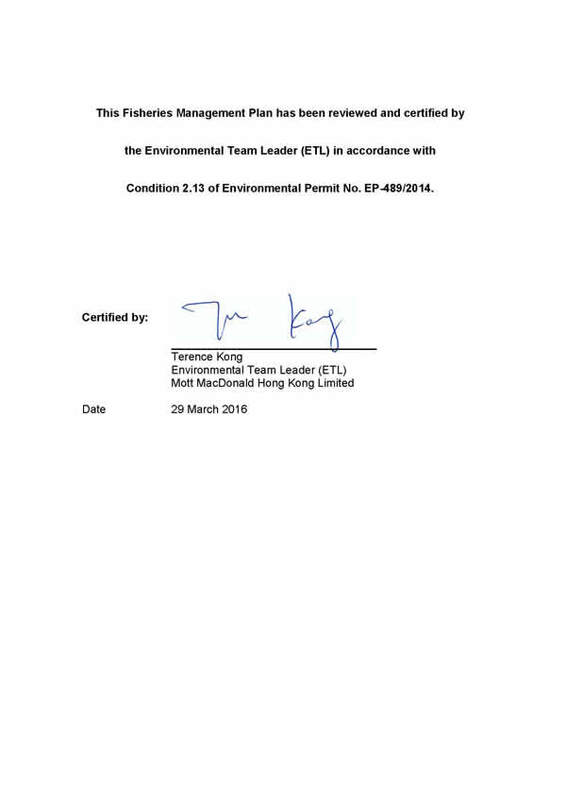 Following a request for further information, supplementary information to the EIA Study was provided to EPD to elaborate the commitments for the MEFES that were outlined in Section 14.11 of the EIA Report (available at http://www.epd.gov.hk/eia/register/report/eiareport/eia_2232014/further_info/pdf/Marine_Ecology_and_Fisheries_Enhancement_Plan.pdf ). The three key enhancement aspects were discussed in more detail in the supplementary attachment, and opportunities for additional enhancement of marine habitats during construction phase were also described. Supplemental information was also provided to outline the public consultation/ stakeholder engagement plan for proposed arrangements for funding and management of the enhancement initiatives, through the establishment of the FEF and MEEF and the associated Fund Management Committees. Details of the mode of operation of the Committees, as well as procedures for allocating and awarding funding, were proposed to be devised in consultation with relevant stakeholders before commencement of construction. Additional detail on the design, operation and management of the MEFES and the implementation of the FEF and MEEF was presented in the 200th meeting of the Advisory Council on the Environment (ACE) held on 15 September 2014 which discussed the EIA Report of the 3RS Project. ACE provided views on the EIA report to the Director of Environmental Protection (DEP) with conditions that AAHK shall establish independent MEEF and FEF for implementation of a MECP and a FMP. AAHK shall also set up a management committee for each of the funds. The Permit conditions set out in the EP () related to the submission of a FMP and the establishment of a FEF are as follows. “The Permit Holder shall establish an independent Fisheries Enhancement Fund (The Fund). The Permit Holder shall, no later than 3 months before the commencement of reclamation related marine works of the Project, submit 3 hard copies and 1 electronic copy of a detailed Fisheries Management Plan (The Plan) to the Director for approval. The Plan shall be prepared in collaboration with fishermen for supporting the fishing industry and enhancing fisheries resources in the western Hong Kong waters especially the Lantau waters. A management committee shall be set up for The Fund with members from fishermen and relevant stakeholders for effective implementation of The Plan. As stated in the MEFES and EP Condition 2.13, the purpose of the FMP is, in essence, to support the fishing industry and enhance fisheries resources in the western Hong Kong waters especially the Lantau waters. A management committee will also be set up for the FEF with members from fishermen and relevant stakeholders for effective implementation of the FMP. By assisting third parties through the provision of funding for relevant measures and initiatives, AAHK intends to create the necessary stimulus to support the enhancement of fisheries resources and sustainable development of the fishing industry. This FMP outlines the proposed mechanism for the implementation, the funding arrangement, and the setting up of a management committee for the FEF to manage and administer the FMP. Some potential fisheries management, support and enhancement initiatives are also included in an annex to this document to provide assistance to the management committee in effectively implementing the FMP. · Section 5 summarizes the overall framework of the FMP. The FMP has been formulated for the management, support and enhancement of the fisheries resources and the fishing industry in western Hong Kong waters especially the Lantau waters. The area of interest for this FMP therefore includes marine waters and habitats surrounding the 3RS land formation and north and west Lantau waters. It should be noted that the initiatives and measures introduced to the fisheries habitats and fishing grounds of the area of interest could potentially introduce longer term benefits to the fisheries of adjacent marine waters. Also the area of interest can go beyond that identified above if it is reviewed in the future that management, support and enhancement initiatives and effort are well spent in this area and other areas in the vicinity would benefit from AAHK’s enhancement strategy. Given the numerous challenges facing the Hong Kong industry culminating from a variety of circumstances over many years, AAHK is committed to identifying opportunities to assist fishermen operating in the western Hong Kong waters. In order to provide extra assistance to the affected fishermen or fishing communities, and also to promote the sustainable development of the fishing industry as a whole, the FMP is tailored towards having a series of initiatives and incentives to help achieve sustainable fishing operations. A majority of these support measures are developed in collaboration with fishermen to ensure that they are practicable, feasible and fit for the sustainable modes of operations and businesses of the fishermen. AAHK has identified the potential to enhance habitats for fisheries resources in nearby sites of fisheries importance and beyond during project development and operation. Habitat enhancement is expected to occur over time in particular from the expanded matrix of marine protected areas, potentially bringing benefits to fisheries resources and subsequently to fishermen operating in north and west Lantau waters. As part of the preparation of this FMP, consultations with the fishery sector have been undertaken to better understand their specific needs for support which could be formulated under the FMP. Focused discussions in the form of face-to-face meetings with representatives of the fishermen associations were completed. These consultations were conducted in 2015 with the LegCo member of the Agriculture and Fisheries Functional Constituency, Hong Kong Fishermen Consortium, the Aberdeen Fisher Women’s Association, the Hong Kong Fishermen’s Association, the Hong Kong Fishery Alliance, Lamma Island Fishing Promotion Association as well as fishermen representatives from Tuen Mun, Tung Chung, Tai O, Tsuen Wan, Cheung Chau, Lamma Island and Aberdeen. Overall the consultees acknowledge AAHK’s effort in assisting the industry through the FMP and the associated FEF and are supportive of the FMP of the 3RS Project. Ideas on specific support and enhancement initiatives or incentives have been provided and these have been incorporated into this FMP where possible. Valuable feedback on the experience that they have for applying for similar funding has been shared with a view to improving the administration and operation of the FEF, and comments on the membership and operation of the management committee of the FEF were also sought. It is AAHK’s intention to continue this open dialogue with the fishery sector during the development and implementation of the FMP. As described in Section 14.11 of the EIA report, the ultimate goal of the MEFES is to provide support to assist fishermen operating in the western Hong Kong waters who have faced an increasingly difficult operating environment in recent years, and enhance marine ecology and fisheries resources in western Hong Kong waters especially the Lantau waters. In this way, the implementation of the 3RS Project is intended to provide an opportunity to give cumulative benefit to fisheries resources and the fishing industry in north and west Lantau waters. AAHK will ensure the FMP is implemented in compliance with the requirements of Condition 2.13 of EP No. EP-489/2014 and have oversight of the implementation of studies and projects under the key aspects and initiatives of the plan. Specific AAHK responsibilities for the key themes are presented below in Section 4 of this document. To meet the goal and objectives of the FMP, substantial resources, both financial and manpower support, are essential. Therefore an independent FEF, managed by a management committee, will be established for effective implementation of the FMP. It is noted that the FEF is intended to fund studies and projects that are non-profit making in nature only. Exceptions may be made for studies and projects with a commercial element to demonstrate the technical feasibility and commercial viability of new sustainable fisheries practices and this would be reviewed on a case-by-case basis. This is further described in the guidance notes of the FEF. The MEFES prepared as part of the EIA Study led to development of a preliminary budget estimate for the MEEF and FEF. The two Funds would be in total in the order of HK$200 - 300 million, subject to approval from the Board of AAHK. Subsequently during the ACE discussion, AAHK had committed a substantial sum of up to HK$150 million for each Fund, and both Funds were initially planned to run for around 10 years, with a large portion of the fund expected to be used for scientific research, studies and follow-on actions/ initiatives in the initial years. Recommendations from initial discussions with fishermen representatives highlighted the need to provide sufficient resources for the long-term and sustainable fisheries conservation and enhancement effort. In response to the recommendations, the initial plan to run the FEF for around 10 years has been reviewed and it is apparent that a fund that can support initiatives over the long term would be much preferred and in line with the fishing industry’s expectation. To achieve this it is considered that an endowment fund arrangement whereby seed money is invested to target the generation of investment return to meet an annual budget (“Annual Allocation”) that is able to support the FMP in the long term. The endowment fund arrangement is targeted to generate 4% annual return based on an optimistic forecast. In the event that the expected investment return is not achieved, any shortfall below the Annual Allocation as approved by the Steering Committee is proposed to be topped up by an additional top-up fund to ensure that resources to support FMP are not compromised. On the basis of the above, AAHK proposes that a funding amount of HK$100 million is to be put under an endowment arrangement targeted to generate an income of HK$4 million to support FEF initiatives for long-term and sustainable fisheries conservation and enhancement efforts. This amount is proposed with consideration of the potential return that can be deemed adequate to fund projects of various scales and duration. 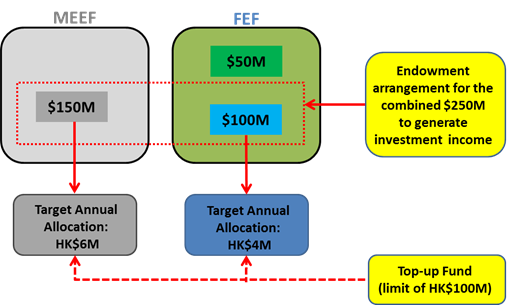 In view of the possible fluctuation of investment income and the need for stable funding support, in particular for the initial years of its implementation, it is proposed to establish an additional HK$100 million top-up fund for both MEEF and FEF to meet any shortfall on investment income below the Annual Allocation for the FEF. In addition, as the key objectives of FEF are to support the fishing industry and to enhance fisheries in western Hong Kong waters consequent to 3RS construction, it is expected a significant portion of the funding support would need to be deployed in the initial years, particularly during the marine construction stage of the project. It is therefore proposed to allocate HK$50 million at the onset of FEF. · Any shortfall below the Annual Allocation amount is proposed to be topped up by an additional top-up fund established for both the FEF and the MEEF, which has a cap of HK$100 million in total. The above fund arrangement is illustrated in Figure 3.2. 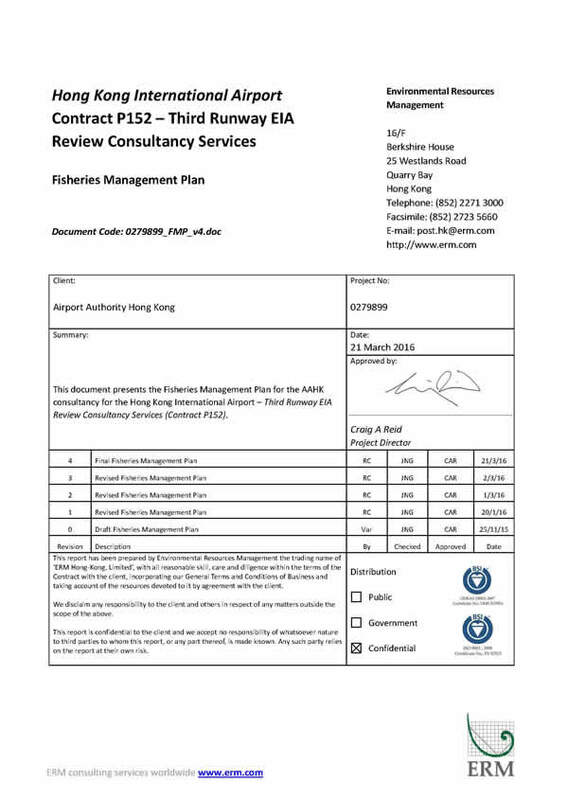 The proposed arrangement provides an initial quantification of funds committed for implementing the FMP, representing AAHK’s commitment in contributing to enhancing fisheries resources and supporting the fishing industry in practical and effective ways in north and west Lantau waters. The proposed funding application, approval and allocation mechanism will be further developed and described in detail in the instrument constituting the fund, the guidance notes and application form for the fund. The FMP will be launched in consultation with relevant stakeholders, in particular the fishing industry. Consequently, in order to formalise the process and provide a platform for dialogue AAHK will establish a management committee (FEF-MC) to administer the FEF for the effective implementation of the FMP. In addition, a Steering Committee is proposed to be established to provide overall directional guidance / policies for the fund operation to enable sufficient resources will remain available for the fund to meet its objectives in a long-term and sustainable manner. The FEF-MC will approve recommended funding applications that are within the Annual Allocation. The Steering Committee will not override FEF-MC decisions on funding application approvals within the Annual Allocation and will not undermine the role of the FEF-MC. The management arrangement of the FEF is illustrated in Figure 3.3. It is envisaged that the FEF-MC will be composed of a membership including AAHK, Fishermen’s Association representative(s) and fisheries expert(s). Relevant stakeholders (including, but not limited to, community leaders, people having expertise/ experience in managing similar funds, academic(s) and green group representative(s)) would also be considered for appointment into the management committee. The exact membership will be determined subject to agreement from potential candidates. AAHK will serve (or will procure a third party to serve) as the Secretariat for the FEF-MC. The setup and operation of the FEF have made reference to the AFCD’s Sustainable Fisheries Development Fund. The remit of the FEF-MC will be to manage and operate the FEF so as to ensure that funds are granted to studies and projects relevant and appropriate to the key themes and initiatives of the FMP. Its primary role is to determine the criteria for the selection of initiatives to be funded by FEF, to make recommendations on funding applications that meet the fund objectives and approve the applications that are within the Annual Allocation approved by the Steering Committee. The FEF-MC will study the proposals and report the approved applications to the Steering Committee. If the recommended funding support exceeded the proposed Annual Allocation in any particular year, the FEF-MC will present the recommendations to the Steering Committee for consideration and approval of the shortfall from the HK$50 million jump start amount and when the HK$50 million jump start amount has been depleted, then from the top-up fund. For each approved application, appropriate reporting on progress is required and the FEF-MC will monitor and review the project outcomes, including the effectiveness of the approved applications in achieving the goals and objectives of the FEF, so as to make necessary refinement/ adjustment to future funding focuses. The draft terms of reference for the FEF-MC (which will be subject to review / revision by the committee members) has been prepared and is included in Annex C.
· reviewing the overall funding situation including the sufficiency and sustainability of the top-up fund arrangement. Besides, if the total funding amount of the applications recommended by the FEF-MC exceeds the Annual Allocation, the Steering Committee may exercise its discretion to approve the recommended application(s) for funding support by drawing the shortfall from the top-up fund. It is envisaged that the Steering Committee will be chaired by the AAHK and composed of the chairperson of the FEF-MC, chairperson of the MEEF-MC and other non-AAHK members nominated by reputable organisation(s) in the environmental management, engineering, investment, or financial areas. For clarity, there does not need to be a member in each of the areas referred to above and the members may be nominated by one or more reputable organisations. The exact membership will be determined subject to agreement from potential candidates. AAHK will serve (or will procure a third party to serve) as the Secretariat for the Steering Committee. It should be noted that the Steering Committee is also proposed to provide oversight to the MEEF and MECP to be prepared under separate cover. The Secretariat will invite reputable organisations in the environmental management, engineering, investment, or financial areas to nominate person(s) having relevant professional expertise / experience to occupy the seats of 4 member(s) of the Steering Committee. · appoint the person nominated by AAHK as described above to be the Chairperson of the Steering Committee upon their acceptance. It is suggested that the membership reflects the four broad themes that will comprise the FMP. The FEF-MC will provide balanced views on on-going fisheries operation and sustainable management and enhancement of fisheries resources. It is proposed that the committee will comprise of 11 to 13 members (including the Chairperson), including Fishermen’s Association representative(s), Fisheries Expert(s), Relevant Stakeholder(s) and up to 2 representatives nominated by AAHK. It is envisaged that AAHK will not chair the FEF-MC. The code of conduct will be agreed amongst the FEF-MC. Fishermen’s Association representative(s) will be engaged as the member(s) of the FEF-MC to oversee the need of the projects, especially in the Fisheries Industry theme and provide comments to enhance current fisheries operations to develop sustainable fisheries industry. Fisheries expert(s) will be engaged as the member(s) of the FEF-MC to oversee the potential benefits of the projects in all themes to consider whether the projects could enhance fisheries resources to achieve sustainability. Fisheries expert(s) will also review the proposed assessment for the measurement of project performance as well as provide comments to enhance the effectiveness of the projects. Relevant Stakeholder(s), such as members from fisheries trade business and aquaculture technology , will be engaged as the member(s) of the FEF-MC to oversee the potential benefits of the projects in all themes. They will justify the proposed assessment for the measurement of project performance as well as provide comments to enhance the effectiveness of the project. Community leader(s) as well as people having expertise / experience in managing similar funds will also be considered for appointment into the FEF-MC to provide advice on the fund administration and help streamline the implementation and management of the fund. In addition, academic(s) and green group representative(s) would also be invited to join the FEF-MC to provide balanced views on on-going fisheries operation and sustainable management and enhancement of fisheries resources. As the core focus areas of the FEF-MC are sustainable fisheries industry and community benefits, it is suggested there will be up to 2 representatives nominated by AAHK on the Committee, which may include the associated specialist / environmental consultant(s). The Secretariat of the FEF-MC will compile a list of potential candidates including, but not limited to, any member of any consultative and advisory committee of the AFCD to be the Chairperson and members of the FEF-MC that satisfy the composition stated above. The Secretariat will invite the potential candidate(s) to be Chairperson or member(s) of the FEF-MC. The Secretariat will appoint the candidate(s) to be Chairperson or member(s) of the FEF-MC upon their acceptance. If potential candidate(s) declined the invitation, the Secretariat will propose alternative candidate(s) to ensure that the FEF-MC would meet the composition requirements stated above. Each member of the FEF-MC will be appointed for a fixed term of 3 years, unless otherwise agreed with that member. AAHK will provide secretarial services (or will procure the provision of secretarial services by an external third party) to the FEF to facilitate the functions of the Steering Committee and the FEF-MC. · work with the AAHK and the Chairperson of the FEF-MC to ensure proper expertise is present at relevant meetings. It is expected that criteria for the selection of successful initiatives for funding will be formulated and agreed by the FEF-MC. The Steering Committee will not override a decision of the FEF-MC and will not undermine the role of the FEF-MC. In general, it is anticipated proposals will be evaluated based on the strength of their contribution to MEFES objectives and the overarching aspects stated in Section 3.2 in terms of providing the outcomes that will clearly benefit habitats and species and stakeholders (public and fishers ()) (Figure 3.4). It is expected that while proposals may focus on one theme, they may be able to contribute across other themes, which could be taken into account in evaluations. It is expected that the FMP will be implemented throughout the construction and operation phases of the 3RS Project. AAHK endeavours to implement the FMP and approve and allocate funding to studies and projects that meet the goal and objectives of the FMP as soon as practical subject to the timely establishment and recommendations from the FEF-MC. A tentative programme for the implementation of the FMP is presented in Table 3.1. The AAHK has been conducting consultations with relevant stakeholders and the AFCD to formulate the FMP. It is expected that the FMP will be submitted to ACE for comment in Q4 2015, followed by submission to the DEP in Q1 2016. The establishment of FEF and FEF-MC will commence after the final approval by the DEP and the fund is planned to be in place for application in Q3 2016. (1) Subject to the final approval by the DEP. In order to determine whether the FMP is successful in achieving the goal presented in Section 3.4 it is important to implement a mechanism for reviewing and evaluating the success of the Plan and supported initiatives. Review and evaluation mechanisms are proposed for each of the four themes in Section 4. The FEF-MC will monitor the performance of the funded applications so as to make necessary refinement/ adjustment to future funding focuses. The FMP is therefore organized into four themes, each of which is developed further and discussed in detail below. A key theme of the FMP is to support measures that help to achieve sustainable management and enhancement of fisheries resources, which further ensures sustainable fisheries resources rather than facilitating the fishing sector to increase their catch. It is important to note that the concept of sustainable fisheries is also embedded in the other three key themes of the FMP whereby sustainable modes of operation and alternative livelihood and business opportunities will be supported; consequently an enhancement of fisheries resources is expected when fishing effort is kept within sustainable levels. Certain management measures, controls and restrictions can be explored and undertaken to enhance fisheries resources. Examples include training to fishermen on the concept of sustainable fisheries in order to raise their awareness of the long-term ecological and economic importance of conserving and enhancing fisheries resources in Hong Kong. Given the challenges facing the marine capture fishery industry (refer to Annex B), it is considered critical to propose initiatives under the FMP to support and enhance on-going fisheries operation in the north Lantau waters in a sustainable manner. Although initiatives are provided to support the ongoing fisheries operations within the north Lantau waters as well as ensure operators explore new fishing grounds, it is considered possible that some operators may want to change their livelihood considering the challenging operating environment. Alternative livelihoods may include aquaculture which is considered as a practical alternative for capture fishermen to make a living using their knowledge on fisheries operations in the marine environment. Certain business opportunities are noted to be fisheries-related and can thus be adopted by the fishery communities. Examples include fisheries-based eco-tourism where tourist can tour the Hong Kong fishing grounds and observe fishing operations onboard. Fishermen using their vessels may also be engaged in eco-tourism related to dolphin watching and recreational fishing. · To build and improve overall capacity of fishery operators to promote sustainable fisheries. · To build and improve overall capacity of fishery operators to adapt to improved technology. · To assist fishermen in developing aquaculture practices by providing ongoing support on technology development, equipment purchase / upgrades, product marketing and knowledge transfer. · To diversify the skills of fishermen to other fisheries-related business by provision of appropriate training. Indicative example initiatives under each of the four themes are provided in Annex D. The initiatives are not considered to be definitive, but demonstrate some possible opportunities under the MEFES for developing sustainable fishing industry and fishery resource enhancement in western Hong Kong waters. It should be noted that the actual initiatives to be undertaken under each theme will be proposed by third-party applicants for consideration by the FEF-MC. The initiatives of the four themes involve substantial activities that need to be conducted during the construction and operational phases of the 3RS development. It should be noted that as the funding applications for each initiative will depend on interest of applicants, it is not possible to estimate funding allocation for individual initiatives at this stage. Funding for initiatives will be as per funding agreements between third-party applicants and the FEF-MC and are also not included in this FMP. It is expected that initiatives submitted by third-parties will have focused implementation/work plans yet to be discussed with AAHK and FEF-MC and that these would be separate activity driven documents and not included within this FMP. Several entities are identified who will be integral to achieving the overall goal of the four key themes. These entities and their roles and responsibilities of these entities are presented below. The main role of the AAHK will be to ensure the FMP is implemented in compliance with the requirements of Condition 2.13 of EP No. EP-489/2014. AAHK will also provide assistance to applicants, on administrative support as well as technical support if needed, e.g. review and comment on the proposed activities under individual initiatives. The main role of the FEF-MC will be to oversee the management and implementation of the activities under individual initiatives. In order to evaluate the effectiveness and efficiency of supported initiatives under the four themes, a process of ongoing performance evaluation is proposed. It is suggested that performance evaluation shall be arranged around groups of specific high level performance indicators. The example performance indicators envisaged at this early stage are detailed in Annex D. The FEF-MC will monitor the performance of the funded applications so as to make necessary refinement/ adjustment to future funding focuses. It should be noted that the performance indicators will be set and agreed between the third-party applicants and the FEF-MC for the actual initiatives to be undertaken under each theme. · Support the promotion and enhancement of fisheries‐related business opportunities. To support the initiatives with the stated goals and objectives in a long-term and sustainable manner, it is considered that an endowment fund arrangement whereby seed money is invested to generate an annual investment return that is able to support the FMP in a long term. In the event that the targeted investment return is not achieved, any shortfall below the Annual Allocation is proposed to be topped up by an additional top-up fund to ensure that resources to support FMP are not compromised. A significant initial allocation outside of the endowment arrangement is also proposed to jump start the implementation of the FMP in the initial years of establishment. It is important to note that the endowment fund with top-up fund arrangement would allow funds to be available sustainably and AAHK will ensure the FMP is implemented in compliance with the requirements of Condition 2.13 of EP No. EP-489/2014 and have oversight of the implementation of studies and projects under the key aspects and initiatives of the plan. 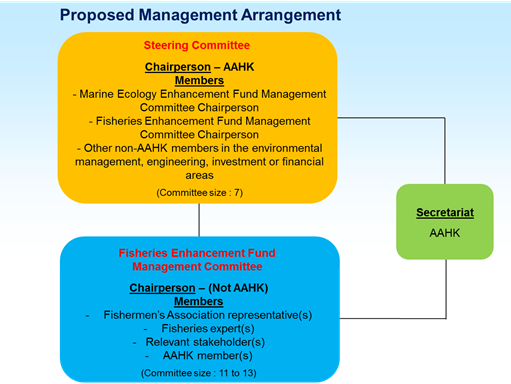 AAHK will establish a FEF-MC, composing of members from AAHK, fishermen’s association representatives, fisheries experts and relevant stakeholders (including, but not limited to, community leaders, people having expertise/ experience in managing similar funds, academic(s) and green group representative(s)) to administer the FEF for the effective implementation of the FMP and approve the applications that are within the Annual Allocation. In addition, a Steering Committee is proposed to be established to provide overall directional guidance / policies for the fund operation to enable sufficient resources will remain available for the fund to meet its objectives in a long-term and sustainable manner. It is planned to establish the FEF and FEF-MC in Q2 2016 and initiate fund application in Q3 2016, subject to the final approval by DEP. () Fishers refer to fishermen and people related to fishing industry.